The Ideal Masters are the malevolent beings that rule the realm of Oblivion known as the Soul Cairn. Typically, they do not physically manifest themselves in the realm, instead preferring a type of omnipresence; however, Ideal Masters have been known to take the form resembling a soul gem, which can be used as a conduit through which the individual can communicate or drain the life essence of an approaching mortal. The Ideal Masters eternally seek souls to bring to the realm, where they become eternally trapped. The Masters view this as peaceful eternal life, although the undead who reside there view it as a curse. Individual Masters have names, so exalted that they cannot be spoken. They call themselves the Makers of the Soul Cairn, and were once mortals themselves. The Ideal Masters often come into contact with mortals. 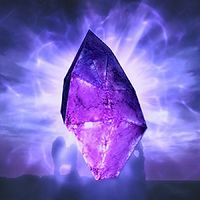 Any soul that is trapped in a soul gem is sent to the Soul Cairn, where it must eternally pledge itself to the Masters. Black souls (i.e. those belonging to the sentient mortal races) are the most common type to be captured, although white souls and dragon souls are also known to reside in the Soul Cairn. Necromancers commonly summoned these trapped souls to Mundus, although the art had been lost by the Fourth Era. Necromancers seeking greater power would historically contact the Ideal Masters, and could gain access to armies of undead in return for souls, although oftentimes the necromancer would be deceived by the Masters who would then claim his soul as well. A notable early example of this would be the deal they made with the dragon Durnehviir, who became eternally trapped within the realm due to their deceit. The Ideal Masters generally manifest in one of two forms: as a small red crystal found "resting" in a coffin, through which the Master can communicate; or as a giant pink crystal, often found hovering above a ruined structure and seemingly protecting treasure, through which the Master can drain the life essence of any mortal who approaches. The effect can be counteracted by ingesting a Soul Husk, a plant native to the realm which can protect one's soul. During the Imperial Simulacrum, the Daedric armies of Mehrunes Dagon captured the Battlespire and invaded the Soul Cairn. The Daedra planned to use as it as a waystation between their own realms and their newly-conquered domains. The Daedra killed the Masters' servants and plundered their treasure, although they also released the souls of several prominent mortal allies whom Dagon had betrayed into the realm. An apprentice battlemage from the Battlespire entered the realm, following the retreating army. Most of the Ideal Masters were unwilling to help the apprentice, but when they learned of the Daedric invaders who would supposedly continue to regularly pass through their realm, one Master instructed the apprentice on how to use the Emerald Gates to leave the realm and continue stalking Dagon's army. The apprentice used them to teleport to the Shade Perilous, and was eventually successful in halting the flow of Daedra through the Soul Cairn by forcing them to relinquish their hold on the newly-conquered realms. The Masters kept the Vampire Lord Valerica a prisoner within the realm for several eras, when she fled to the Soul Cairn with an Elder Scroll. In 4E 201, the Last Dragonborn and the Vampire Lord Serana entered the Soul Cairn in search of Valerica. The interlopers defeated several of the Masters' most powerful servants and freed Valerica. The Ideal Masters appeared in An Elder Scrolls Legend: Battlespire and the Dawnguard add-on for TES V: Skyrim. At some point in the development of Battlespire, the Ideal Masters were referred to as "Gem Vampires". For game-specific information, see the Battlespire and Skyrim articles.